I had the opportunity to teach another class at Mini Minds! I was so excited to have 4 families that signed up for the Brain Boosting Lunches workshop. I have wanted to put together a class where parents'/caregivers can attend with their child and both adults/children can participate, try new foods and learn something about food. This has been a learning process to figure out the best way to put together a class that is worth the money, provides a unique experience and is also cost effective. The key has been to find the right price point. 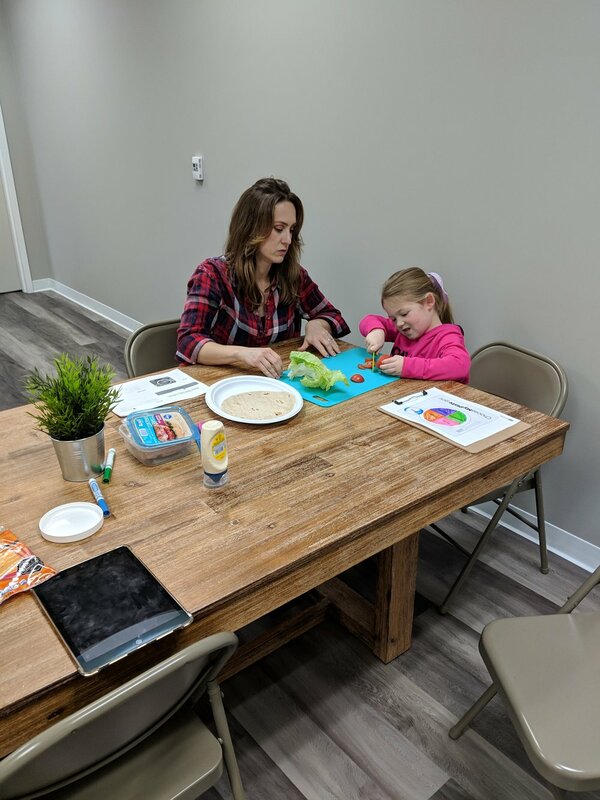 There isn’t another cooking/nutrition class in the Indianapolis area where parents and kids are together and get to work with a Registered Dietitian. This is a unique opportunity and I want to make sure that families know that this is available and find it worth their time! It can be challenging to put together a fun, learning filled opportunity for families. The workshop lasts 1.5 hours and costs ~$35. If you are interested in participating in the next one that I offer, let me know! This most recent class was focused on creative ways to put together a healthy lunch for your child. Lots of parents pack lunches for their children and send them off to school. Some times it is easy to get stuck in a rut of making the same thing over and over again. Finding ways to break out of that boring routine and then making healthy meals for your child is important. During the class we started off talking about the MyPlate model and the 5 different food groups. We talked about what foods would be in each food group and what foods the kids enjoyed or didn’t enjoy eating. I wanted to include some nutrition education so that when the kids see the MyPlate again in school, they are familiar with the concept and willing to have different food groups at each of their meals. This workshop session occurred during lunch time and so of course all of the kids wanted to eat and make food! So we jumped right into making our lunches for the day. I provided a handout with information about the food groups and then lunch ideas including some recipes as well for the parents to take home with them! Below is the lunch that we made as a group. We did a special twist on a classic school lunch item - the lunch meat sandwich. I wanted to do something familiar that everyone would like, but have it presented in a different way. These sandwich pinwheels did just that! They worked out great and some of the kids tried some new foods, like tomatoes and hummus and others were interacting with a non-preferred food (like cutting it up) which was great. We paired the pinwheels with some fresh veggies - carrots and cucumbers with hummus as the dipping sauce. I had planned on doing a dried fruit with these as well - like raisins, but those weren’t available at the time so we stuck with the veggies and the pinwheels as our lunch for the day. Overall I think the families had a great time and were able to learn some things. I think this also provided a chance for the parents to interact and get to chat with one another. That can be nice to have some support from fellow parents when it comes with dealing with children. This was another successful workshop and I am excited to brain storm as other ideas for the upcoming 2019 year with Mini Minds and get some other dates on the calendar. If you have any creative ideas or have a topic that you would want to learn more about, leave that as a comment below and I would love your suggestions.